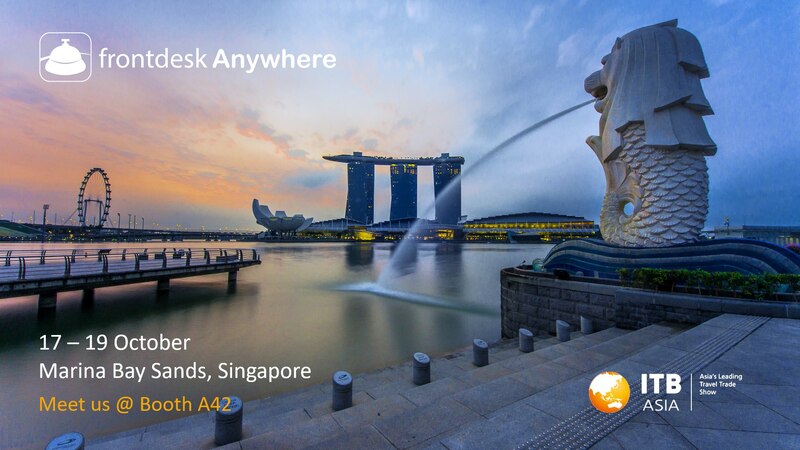 Frontdesk Anywhere, the award winning cloud-based property management system is excited to announce its participation at ITB Asia 2018 in the Marina Bay Sands, Singapore. This will be the first year Frontdesk Anywhere has exhibited at ITB Asia and we are thrilled to bring our best in class hotel technology to hoteliers from all over Asia. It's with great pleasure we have the chance to meet and greet our hotelier clientele, as well as, our industry innovating partners who help us to continue to expand our software suite. Frontdesk Anywhere gathers hotel industry veterans and technology experts to offer you a cloud-based Property Management System that fits your needs. We help you tackle the complexity of the continually evolving hospitality industry. Front desk operations, rate management, guest communications and housekeeping are just the beginning. At ITB we'll be showcasing our PMS platform including our latest and greatest features as well as connections to new partners in the hospitality industry. Talk to us to learn how you can improve guest satisfaction, increase your revenue and lower costs all while building greater guest loyalty. The theme of ITB Asia 2018 is Reimagine Travel. The event will host hundreds of innovative companies in travel and hospitality experts will discuss topics such as blockchain, AI and robotics and the future of the hotel industry. We're excited to be among these companies revolutionizing hospitality. If you'd like to make an appointment with us please click the button below to schedule a time with our team. We look forward to seeing you there!